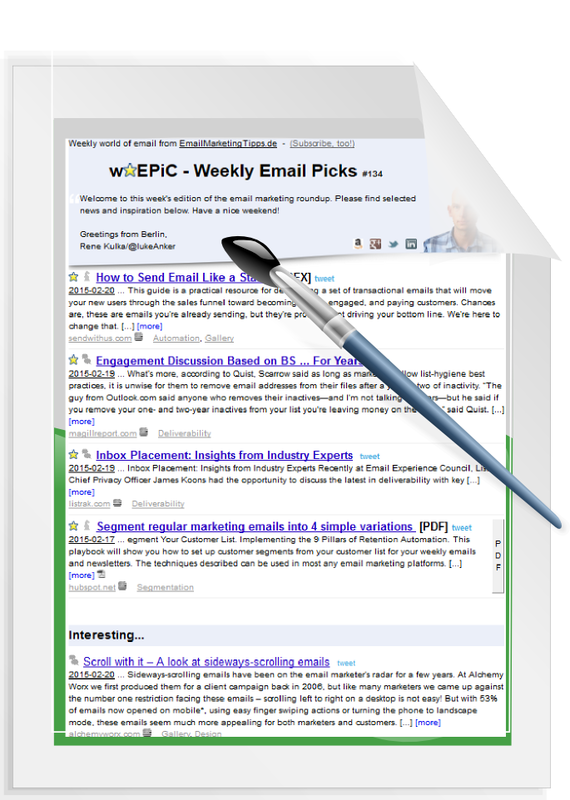 ← Which list building tactics are effective and yet easy to implement? I’m always glad when I get feedback on my email marketing work – feedback from blog readers, from book reviewers, and especially from subscribers to the weekly email marketing roundup. Open and click rates are good things to have, but sometimes it’s more inspiring to look at non-aggregated, discrete, unstructured, plain, personal and sometimes harsh opinions. Reading replies makes email marketing feel more “one-to-one”, and – even better – there much to learn from them. and when unsubscribing from future messages. I read all answers carefully, and I use compliments as testimonials to convince blog readers of signing up. 1. Email Design: More important than you thought? In traditional direct marketing, design is considered to be a less important success factor compared to e.g. choosing the right offer and the right segment. However, one must not neglect it. A poor design will fail to guide the recipient eyes through the answers to her questions; no answers often mean: no response. What surprised me was that some folks unsubscribed because of colors, layout etc. I mean the newsletter is a Google’esque stacked wrap-up of relevant web resources, it’s no illustrated magazine. At least I thought so. However, the unsubscriber feedback underlines that a good first impression counts. Say hello to the halo effect – one cannot please everybody, but one also should not underestimate the value of an appealing visual identity. 2. Permission: IS DOI REALLY enough? Folks, go quadruple opt-in! No, just kidding. But honestly, I believe in double opt-in (aka confirmed opt-in). And I’m not alone. DOI should make it virtually impossible to spam people. Thus, it provides marketers with the strongest permission and the highest response rates. Do you fear list shrinkage due to unconfirmed opt-ins? Well, minimize the loss to close to zero by optimizing your sign-up procedure. How can it be that still some unsubscribers say they don’t know the sender and some call the newsletter “spam”? It not even contains any advertisements. 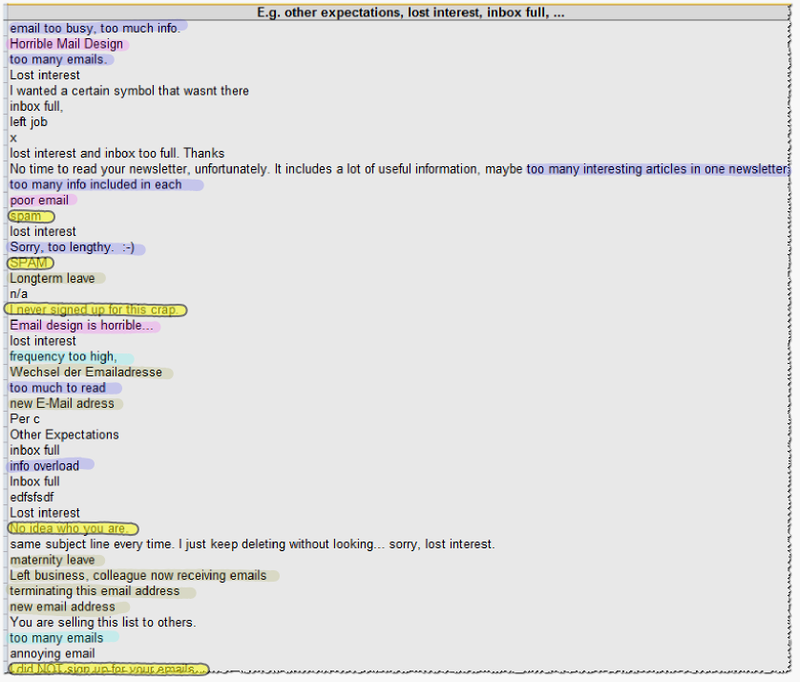 One might say that spam is always in the eye of the beholder (UBE, UCE, too often, looks ugly, …). But getting permission couldn’t be clearer, could it? The learning is: Even double opt-in is by no means a guarantee that all subscribers really want your emails. Just the true and confirmed opt-in is. 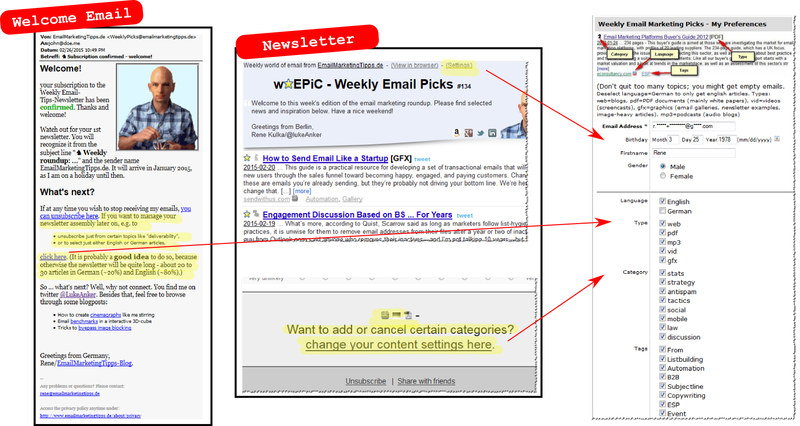 The email marketing roundup is a rather long newsletter as measured by its pixel height and copy length. In addition, it usually arrives weekly. Both contribute to a very high perceived frequency, which is one of the main reasons for unsubscribes. As you can see in the screenshots above, the preference center is promoted during the sign-up stage and later on in every email. Yet, many unsubscribe because of “too much information”, “too lengthy”, or “too often”. The profile is hardly used. Why? I guess because no one looks for functional links (except for “unsubscribe”) and advice. Inboxes have very short attention spans. The newsletter is scanned too quickly for value. That means if you want to make self-customization work in your emails, let this feature be eye-catching. Perhaps even push it by incentivized dedicated emails every now and then. A small link might not be noticed as you would expect. 4. Dead addresses? Resurrect them! When looking at unsubscribe reasons, it always astonishes me how much churn results by employee turnover and other inbox abandonment.